C. F. Martin Style 0 Model Soprano Ukulele, c. 1924, made in Nazareth, PA, dark mahogany finish, mahogany body and neck, rosewood fingerboard. 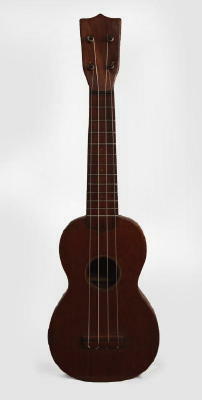 A nice example of an early-1920's wooden-peg Martin Style 0 ukulele. Although these were C. F. Martin's least expensive instrument (originally retailing in the $10-12.00 range) they are built to the highest standard and are still considered amongst the best sounding and playing ukuleles ever manufactured. The Style 0 is simple and devoid of ornament but has as beautiful a tone as most any Martin uke. Overall length is 20 3/4 in. (52.7 cm. ), 6 1/4 in. (15.9 cm.) wide at lower bout, and 2 3/4 in. (7 cm.) in depth at side, taken at the end block. Scale length is 13 3/4 in. (349 mm.). Width of nut is 1 7/16 in. (36 mm.). All original, minor wear, a few very small tight grain cracks but a really nice early Style 0. One of the wooden pegs has been repaired but is solid. A very nice player with an excellent sound. Overall Excellent Condition.